Improving with every sip, gaining structure and depth with every extra minute of air, this is a beautiful baby that will, with time, mature into a gorgeous adult. Showing dark fruit (blackcurrant and mulberry), it has a background of tobacco leaf and the tiniest touch of cayenne. Rich very dark chocolate and espresso pop on the mid-palate. Tannins are very sweet and dusty. Even with all the rich sweetness, it also has good acids and an underlying minerality, offering a decade or more of maturing in the cellar, and offering layers of primary and secondary flavors in the future. Drink with a good steak and a better friend. It is very highly recommended. 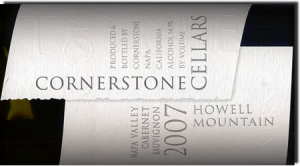 An interview with Craig Camp, General Manager of Cornerstone Cellars. Craig’s experience in the wine world began as partner and Vice President of Direct Import Wine Company, President of Terlato Wine Group, Italian Wine and Food Editor of eGullet.org, President of Anne Amie Vineards, and now, General Manager of Cornerstone. 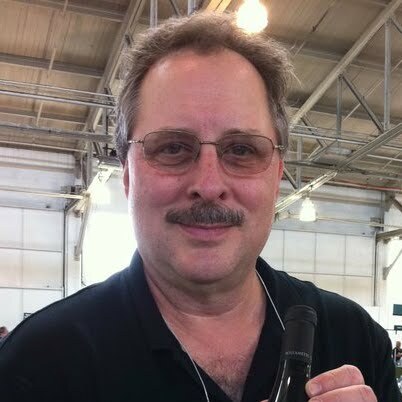 Craig serves on the Board of Directors of the Howell Mountain Vintners and Growers Association and on the Napa Valley Vintners Association Marketing and Social Media Marketing Committees. 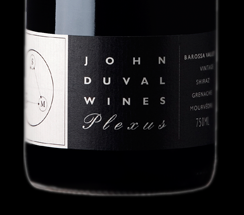 Congratulations on being awarded Palate Press’ Wine of the Year Award. That is selected by, first, our readers, who pick the Palate Press Wine of the Week in our Saturday polls, and then by more than 120 wine lovers and wine professionals at the third annual Palate Press Grand Tasting. Needless to say we’re flattered and honored. It is always gratifying to those of us who shy away from the blockbuster style to gain such attention. What made 2007 so special in Napa Valley, and particularly on Howell Mountain? It was about everything you could hope for in a vintage. If you didn’t make a special wine in 2007 you never will. This is a no-excuse vintage for Napa winemakers. The early bud break gave Howell Mountain growers a long growing season in a slightly cooler year, which allowed even ripening and full flavor development while still retaining excellent acidity. In addition to the vintage, was 2007 a special year at Cornerstone? Indeed this is a special vintage for us as it truly was the beginning of a quest. This is the vintage where we began a more focused effort to craft to more expressive, terroir driven wines. I believe you can see a real difference in our wines after 2006. Obviously, they were extremely well received by the critics up to that point, but we felt we could go further. Critical acclaim is not enough on its own, at least for me. You have to make wines you believe in: wines you want to drink with dinner. Napa is well known for big critic pleasing wines, rich with fruit and tannin. You managed to hit those marks while retaining great acids and minerality, hallmarks of a wine that will cellar for years. Are you doing something different, or are we seeing a change in direction for Napa Cabernet? We are committed to expressing the terroir of our vineyards. In Napa, of course, this means wines of power and concentration, but this does not preclude wines with balance and finesse. I think we do several things that differentiate us from many wineries in Napa. First, we pick a little earlier, at lower sugars than many. Our main indicator for picking is flavor maturity, not a Brix level. Acidity is everything to us as it’s what makes a wine live. In a climate like Napa, we’re more worried about acidity than sugar levels. Certainly we are not alone in this, but perhaps we are in the minority still. My main goal is always that we make a wine I love to drink on a regular basis. I just don’t like massive, high-alcohol wines. For me, the defining characteristic of a great wine is that the second glass, or last sip, is more compelling than the first. A really interesting wine should make you take a bit of time to really get to know all it has to offer. One of the things tasters noticed in the 2007 Howell Mountain was that teasing background hint of cayenne that flashed right before the mid-palate pop of dark mocha. Is that a product of the vintage, the Mountain, or the cellar? Where does it come from and is it an identifying hallmark of your wines? If it was a product of the cellar, I would be upset. If there is one thing we don’t want in our winemaking, it’s a trail of breadcrumbs saying we were there. Those aspects you mention are an expression of this vineyard: this terroir. This is a special site and our only goal is to let it express itself. This is the very top block in the Ink Grade Vineyard, with a perfect southeastern exposure running from 1800 to 2000 feet. The soil is very powdery, decomposed volcanic ash that has little or no organic matter. The farming has been certified organic for almost a decade and, with each vintage, the site is becoming more and more expressive. The extremely complex aromatics and flavors are the product of the vineyard, not the cellar. Craig, you are well known for keeping a big library. Where will the 2007 Howell Mountain rate in the library and how much of it are you setting aside? It is delicious now, a sweet brawny youngster. When do you think it will hit the height of maturity? There is no doubt that 2007 is a very great Napa vintage and will have a distinguished place in our library. We’ll set aside about 25 cases so that we can enjoy it as it reaches its peak. Don’t be deceived by the softer tannins, which are mostly due to more intelligent tannin management in the vineyard and cellar. The same amount of tannins are there and they will allow the wine to age just as well, but they are rounder and less green on the palate. I think this wine will be fully developed at ten, and then age gracefully for many years. Do you think any of the newer vintages will match, or surpass, the 2007? Which ones, and why? It’s too early to make such predictions as only time will tell. I feel very strongly about the wines we have in the cellar and I think they have incredible potential. We have come a long way since the 2007 vintage and I believe our farming and winemaking have become much more sophisticated, as we have gained knowledge with each vintage. We have been fortunate to have gotten access to some incredible vineyards, something that has increased our artistic palette of sites. The combination of all these things, along with my own tasting experience of our wines in the cellar, tell me we can and will surpass even this excellent 2007 in quality. With the 2009 vintage we are introducing a new wine simply called The Cornerstone. It’s a blend of cabernet sauvignon, merlot and cabernet franc selected from our most exciting barrels. The percentages will change vintage to vintage with any one of the three varieties predominating. Only quality will dictate the blend. Total production will be less than 200 cases. We bottled the first The Cornerstone last July and I can say with confidence it is impressive. We will be releasing it in July 2012.